BEADazzled is dazzling! | NJNA is Blogging! My last class began this morning. Yesterday's outings revitalized me and I was off to new adventures in the stitching world this morning with Nancy Cucci's class where we will be attaching over 2500 beads before finishing, yes, I did not make a typing error, 2500. The piece is about 5.5 inches square. Today we learned three different patterns for the beads. The first was to stitch a basket weave stitch but with on open thread between the stitches. The beads are applied to every other open intersection making the overall appearance less intense. The second area had the same open basket weave but with beads applied to each open intersection making the appearance of beads stronger. (You will have to take my word for it having seen the model because I have not yet put beads into this area). The next area you stitch the beads on with floss on every other intersection so that the beads are in diagonal rows. 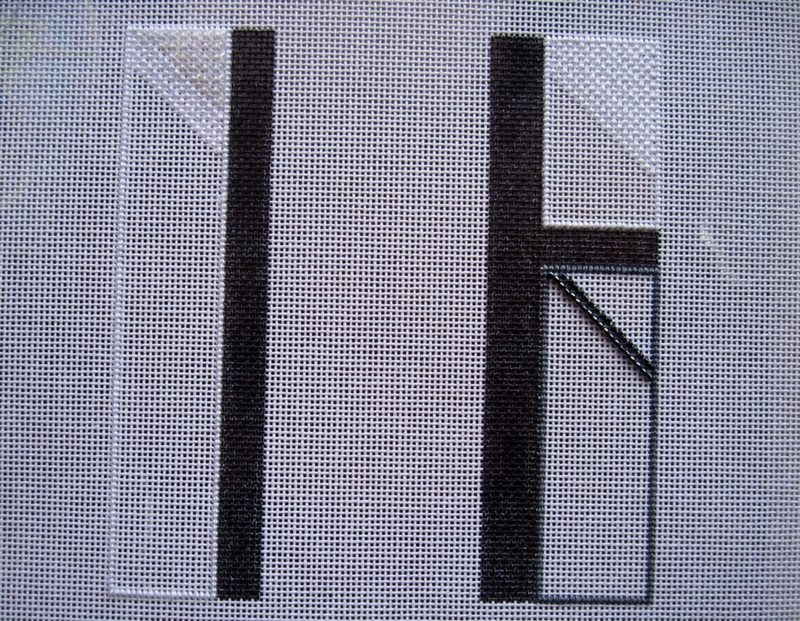 Next we will stitch in floss between the beads over two threads so the overall appearance is off a diagonal mosaic. The pilot group for this class was Fox Chapter which is near to Chicago. Many of the participants in the pilot class are working here at the seminar and are unable to take classes. They did bring in their finished projects for Nancy (and us) to see. Nancy suggests that we take her design and use it as a starting point although we could stitch the design as the model is stitched. Seeing the pilot stitchers' finished pieces certainly did give us ideas of changes that could be made very simply. Tomorrow I will give you an idea of what my possibilities will be. After class while Rosie and Carol went for a swim, I walked down to Millennium Park. This weekend is the Jazz Festival in Chicago and they were getting ready for a concert tonight at the open air auditorium in the park. I saw many couples and couples with youngsters walking toward the park with their chairs, blankets, coolers, etc. in preparation for a picnic on the lawn before the event. On the way back to the hotel walking across the bridge over the Chicago River, I saw not only the tour boats but also a number of kayakers enjoying a late summer outing on the river on a beautiful evening. Last day tomorrow; how did the week go by so quickly!